Church of Jesus Christ of Latter-day Saints. Record of Members Collection. Salt Lake First Ward. CR 375 8, box 2168, folder 1, image 59. Church History Library, Salt Lake City, Utah. Utah. Death Register, 1847-1866. Sylvester J. James. Utah State Archives and Records Service. Series 21866. Salt Lake City, Utah. Salt Lake City, Utah. Cemetery Records, 1848-1992. Sylvester Baby James. Database. Ancestry.com. Salt Lake County, Utah. Death Records, 1908-1949. Sylvester James. Database. Ancestry.com. 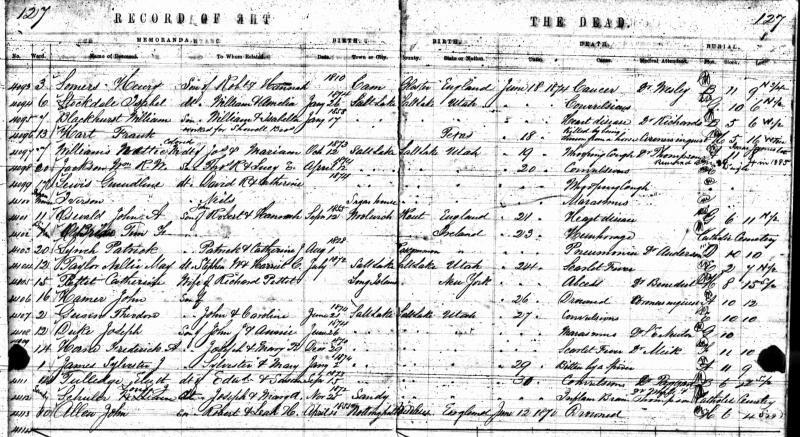 Utah Death Register, 1847-1866, Sylvester J. James, Utah State Archives and Records Service, Series 21866, Salt Lake City, Utah.